There are many types of splints and dental bites in circulation that are used and erroneously passed off for being able to fix many different problems: nocturnal teeth gnashing, improve breathing, bites against backache, anti-stress bites, bites that improve sport performances, mouthguards, bites that improve posture etc. etc. In fact, the only dental-bite able to fix all the problems listed above is Rectifier Starecta because it has been manufactured with such features that are able to activate the mandibular leverage that pushes the skull into an ideal position and stretches the spine. In addition to that it is able to act on facial symmetry thanks to the creation of a symmetrical occlusal signal. The rectifier can be used with a Hard approach (worn all the time) or with a Soft approach (worn for few hours a day) when needed. We will try to properly understand what it is all about and which are the differences between HARD APPROACH and SOFT APPROACH. Some bites in fact are made of hard resin and have the characteristic of being thin and smooth on the occlusal surfaces. These bites are generally used to fix cranio-cervico-mandibular disorders. Being thin they create a small distance between the upper and lower dental arches. In this category are included, for instance, Gelb plate and other bites produced by gnathologists and dentists. Some bites create pits and a greater height between the dental arches (upper and lower) and usually are made of rubber or soft materials. For instance, Dr.Brux bite or some sport mouthguards. Michighan bite is crafted on the upper arch and is characterised by the canine strips to control laterality (http://www.zocchelab.com/products/bite-di-michigan). It is made of hard resin and has smooth occlusal surfaces. This is a splint made of hard resin that is placed over the upper dental arch with a smooth occlusal surface. In some cases, it has a rise in the incisors area. These splints lack the features required in order to activate the mandibular leverage that supports the skull and balance the occlusal contact points in order to stretch the spine and restore a proper posture. Many of these dental splints are limited solely to give relief to the cervical region. Moreover, none of these dental splints has any pit on their surface and the application of any protrusion. All above mentioned dental splints do not fix the issue previously addressed because they lack the required elements able to permanently change in significant manner the occlusion and bring back the skull into its ideal position. Michigan Plate, Gelb bite, Jankelson Orthotic Device do not retrieve the dental vertical dimension because they all lack the necessary splint height, the protrusion and the pits on the surface. These splints are smooth and with no pits on their surface so there won’t be any neuro-muscular activation. As a matter of fact, with no dental height and protrusion the leverage effect of the mandibular leverage does not happen, and the skull cannot go back into its proper position. Finally, these dental splints are not supplied with an annexed method which mandates the individual to move the mandible forward in order to adjust the occlusion. Which are the main features of the Rectifier allowing to carry out its job? These features can vary according to the type of posture and to the feeling provided by the Rectifier. It is important that these 4 features would work together simultaneously in order to activate the effect of the mandibular leverage or the molar leverage that balances the bite and pushes the skull upwards stretching the spine. The mandibular protrusion and the height of the Rectifier in the premolar and molar area together activate the leverage effect that allows the body and the spine to stretch and straighten, recovering the desired balance. The leverage effect allows to retrieve the rear vertical dimension in the premolar and molar area and so to balance the body. This is the key to recover from dorsal kyphosis, lumbar lordosis, scoliosis, protruding head and shoulders, problems to the cervical area, ATM issues and many other symptoms like backache, breathing issues, compressed viscera issues etc. How does the Rectifier act on the body? We usually believe that the skull is supported only by the last cervical vertebra thanks to some stabilizing muscles connected to it, but there is nothing that could be more wrong than that! How could be possible that nature had been so dull to believe that the skull, the heaviest part of the body, could be in a state of imbalance on the last cervical vertebra (atlas)? Had it be this way, we all would have broken, many a times, our neck in our lifetime. Nature is not dull, we are dull since we do not understand such simple biomechanics like the mandibular cranial-spinal one. Our head is for sure resting on the atlas, however there are two more critical points of contact on the front: the right and left dental arches. It is not easy to understand this concept, conversely it is completely counter-intuitive. How can it be that the mandible would help the last cervical vertebra if that is a bone suspended below the skull? Moreover yet…. since the mandible is always moving, in order to speak or chew, how can it be that it has such a critical role in supporting and providing stability to the head? It is not easy to comprehend that, because the mandible provides support, when required, getting into occlusal closure, especially when under strain in order to stabilize the whole body’s posture! The mandible provides a dynamic support to the skull allowing it to remain straight on the last cervical vertebra, in order to better understand this system, I recommend you to read this article (body’s posture depends from the teeth http://starecta.com/body-posture-depends-teeth/). The Rectifier is the only dental splint that exploits the muscles strength and occlusal signals in order to support the skull and balance the muscles. Well ok, but why does it work? The Rectifier allows the mouth to close slightly protruding and increases the distance in the molar area. The mandible, when you swallow or simply when you keep your mouth closed, remains in its normal position (so called normal occlusal). Conversely the Rectifier generates a different occlusion bringing the mandible in a slighter lower forward position. At this point the mandible that is stabilized in the Rectifier cannot go back to its position of normal occlusion. At this point, since the mandible is attached to the skull through the occlusal contact points created on the surface of the Rectifier, it is compelled to bring the skull back and maintain it in a higher position! The outcome generates a feeling of support of the head from upwards, with no effort at all. In short, who wears the Rectifier feels his/her head slightly standing on his/her mandible. Moreover he/she feels a feeling of stretching the spine, the shoulders, the trapezoids and an enlargement of the ribcage. Our mouth apparatus consists of very strong muscles, like the tongue and the masseter muscles who, had them operate in a beneficial manner, can straighten the back and balance the body. How the Rectifier is acting on face and body symmetry? During the Rectifier activation, as shown in this video (https://www.youtube.com/watch?v=NcjZxOsYBa0), the teeth sink into the thermoplastic material that later hardens and recreates a new occlusion. This new occlusion creates a symmetry of forces distributed along all of the dental arches because the thermoplastic material fills up all the gaps and the areas that have a reduced dental pressure, thus recreating a symmetrical occlusion. This way the masseter muscles, the temples muscles, the muscles located below the thyroid, the tongue and the muscles of the whole mouth apparatus (including the eye muscles) start working in symmetry! When all the muscles of the mouth and head start working in symmetry they move the soft parts of the face like skin and cartilage providing an appearance of improved symmetry. This process of course has an impact on all the muscles of the body. In fact, one of the most recurrent feeling that people wearing the Rectifier have consists of having stronger arms, an improved stability along the spine, the abdomen and torso. However, the best way to understand how powerful these feelings are is to test the Rectifier on yourself. WHICH ARE THE DIFFERENCES BETWEEN A HARD APPROACH AND A SOFT APPROACH AND WHICH IS BETTER ? Who decides to try a Rectifier has two roads in front: a hard approach and a soft approach. The main differences that separate these two approaches consists essentially of the usage time of the Rectifier and its effects. 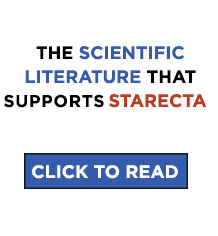 Starecta was born some years ago with a very radical approach: according to the original approach all the Body Balancers should have worn the Rectifier for 24 hours a day and remove it just for few hours, had they perceived some particular discomfort. 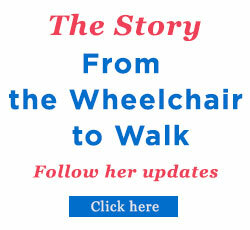 This way the body would have enjoyed all the effects of a bio mechanical postural balance with no interruptions. However, over time we have realized that there are people that do not want to apply Starecta in a radical manner, but at the same time want to enjoy some of its benefits. This is the reason why we have invented the soft approach. The soft approach provides the body the temporary support at some hours of the day: during our workout, against back pains, to avoid gnashing teeth at night, to breathe better, etc. Now let’s have a look at the pros and cons of these two different approaches, hard and soft. Wearing a Rectifier in practice all the time, provides huge benefits for body balancing, however there are also some disadvantages. 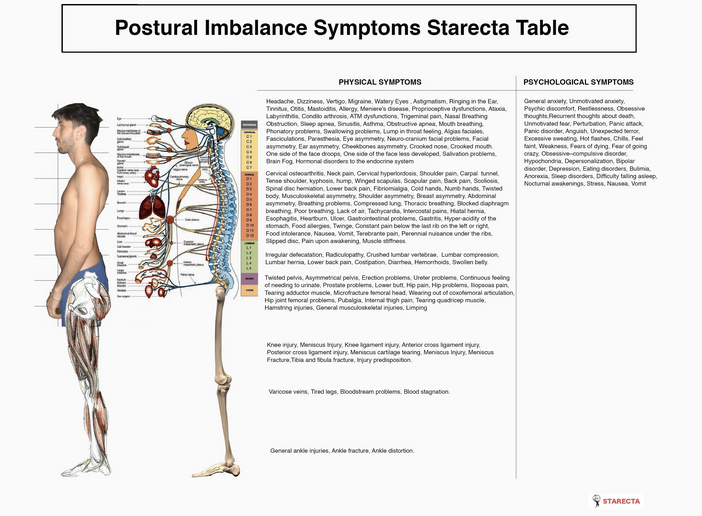 1) It is possible to deal with symptoms that were formerly unthinkable to deal with like shown in the postural table or running through the many witnesses on our website (http://starecta.com/wp-content/uploads/2013/01/tabella-sintomi-finale.jpg). 2) A Hard approach provides a better stability and strength to the body even for the few hours when the Rectifier is not worn. Additionally, it allows to carry out balancing for the whole route. 3) A hard approach allows after 3 – 5 years of usage to have a straight, stable and well-balanced body. A hard approach literally changes the body removing muscles torsions and damaging strains that create pain and make impossible to carry out some movements. 4) After having applied for about 3-5 years the Starecta method and a definitive orthodontic work, your body won’t need the Rectifier any longer. With the hard approach you will have to wear the Rectifier from 16 to 22 hours a day for the outcome not to be lost and the balancing to be carried out until achieving a symmetrical posture. It is possible that during a hard approach the mandible would reach a temporarily more forwarded position with regards to normality in order for the body posture to benefit from that (increasing the effectiveness of the leverage effect), especially for the second-class groups. Around the end of the balancing the mandible will go back into its original position. Due to the work of the Rectifier on the torsions of the body it is possible that small motions of the teeth may happen. The skull hinges on the Rectifier in order to decompress and relieve all muscular strains that exist in the body. This way nerves, blood vessels, veins and organs are decompressed. The body unscrews literally like a bottle cap; however, the continuous work of the Rectifier can cause small motions of the teeth, easily fixable with an orthodontic work. A soft approach is ideal for those that want to start Starecta, because it allows to experiment almost all the benefits of the Rectifier without getting the disadvantages. A soft approach is perfect for those that gnash their teeth at night and do not breathe well, or for those that wish to improve their performances in the gym. This is a very useful approach because it ensures stability and symmetry in those moments when your body would need them the most. A soft approach allows to have stability and symmetry of the muscles and to balance the posture when worn, however when removed you will go back to the previous position without causing any change in your body. This is the reason why it is widely recommended to those that are still hesitant. With a soft approach, the Rectifier can be used every time you feel the need to wear it. 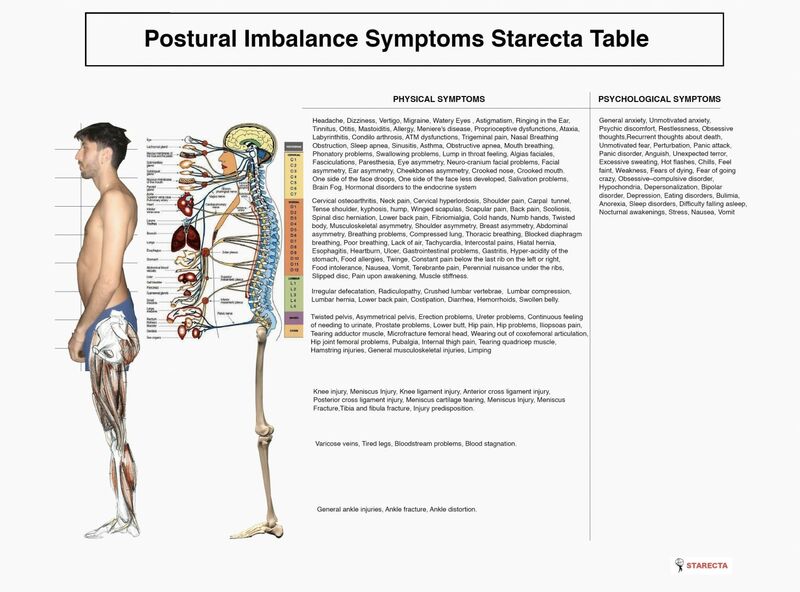 It allows to balance immediately your body and improve your posture in a natural and biomechanical manner. You will be able to stand up straight even without thinking of that. You will be able to stand up straight with no effort. It allows to have immediately an increase of strength in all of your body, in all of your muscles. It allows to counterbalance the strength in all of your muscles in equal shares. If for instance you have a limb that is weaker than the other one or a part of your body that is weaker, or even one eye that is smaller than the other, it allows to counterbalance immediately all the muscles of your body. It allows to fix many symptoms like cervical pain, protruding skull and shoulders, facial asymmetries, pain at higher and lower back, it allows to remedy dorsal total kyphosis and lumbar total lordosis, tmj issues, tinnitus, improves breathing, fixes nightly gnashing, fixes neurological issues and muscular contractions caused by vagal compressions etc. It allows to train much more effectively in the gym. Those that wear it while exercising, are able to load more weight and carry out the exercises symmetrically with many more repetitions. 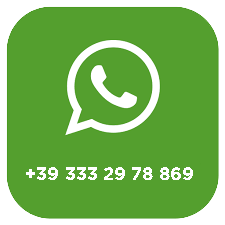 It allows to be aware of your own body and of your own posture understanding why until now you have suffered so much because of your postural issues, of nerves, muscles and tendons having been compressed. You cannot go on towards a complete body balancing. However, if you do not have severe issues and have the need to fix severe symptoms, a soft approach remains the best choice for people that do not want to change their body. A soft approach allows anyway to delete many symptoms and improve the gym workout. Anyway, for those that still feel a bit hesitant I absolutely recommend to use a soft approach. 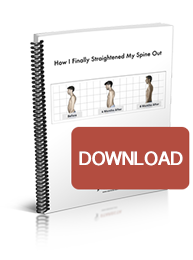 A soft approach allows you to better understand the feeling of wellbeing provided by a proper posture, the higher amount of power available, the reduction of important symptoms, with no risk. A soft approach, for neophytes and for more hesitant people, represents the best way to start, in order to familiarise with your own body. After having begun with a soft approach it will always be possible to switch to a hard approach and keep on balancing your body achieving all the desired benefits.